The display language is the language that Windows uses in wizards, dialog boxes, menus, Help and Support topics, and other items in the user interface (UI). 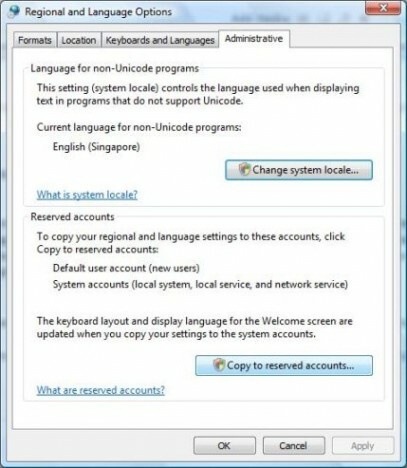 In Windows Vista, additional display languages in MUI (Multilingual User Interface Language Pack) can be installed by users of Windows Vista Ultimate and Enterprise editions (other editions allow only one display language). 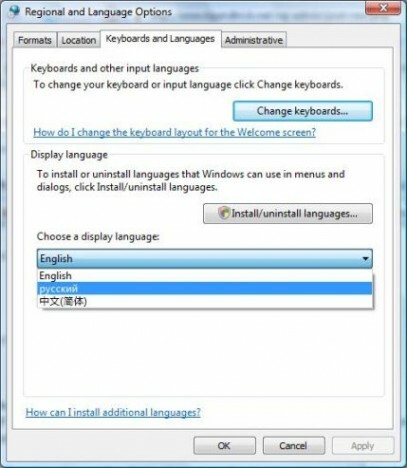 When there is more than one languages installed, users can change and switch display language using steps below. Click on Change display language under “Regional and Language Options”. For users on Classic View, click on Keyboards and Languages tab. Under Display language, choose a language from the list. If no list of display languages been shown, make sure that you have installed additional language packs or files. Click OK (skip if you intend to change the language of Welcome screen too). In the “Regional and Language Options” window, click on Administrative tab. Click on Copy to reserved accounts button under “Reserved accounts” section. If you are prompted for an administrator password or confirmation by UAC, type the password or provide confirmation. In the “Regional and Language Settings” dialog box, check to select System accounts (local system, local service, and network service) check box. The system accounts are special accounts used by Windows‌ services. This setting allows administrators to specify a display language and keyboard layout for the Welcome screen. It also sets the display language for users who have not specified a display language. Optionally, to copy the current settings to the default user account, select the Default user account (new users) check box. The default account is used as a template for creating new user accounts. This setting allows administrators to set the default format, keyboard layout, and display language for new users. Any user account created on the computer after the settings have been copied to the default user account has these settings applied to it. Existing user accounts are not affected.